Click here for a Brake System Detail. Today, virtually all cars come with ABS as standard equipment or as an option. The typical ABS system includes wheel-speed sensors, a hydraulic control unit, and an electronic control unit. When you apply the brake pedal the electronic control unit monitors and compares the signals from the wheel-speed sensors. If the electronic control unit senses rapid deceleration (impending lock-up) at a given wheel, the electronic control unit commands the hydraulic control unit to reduce hydraulic pressure to that wheel. This type of pressure limiting is similar to pumping the brake pedal, only much faster. Some pick-up trucks and cargo vans have rear-wheel-only ABS to handle different braking needs under different loading conditions. This type of ABS system controls only the rear wheels and limits pressure when either is about to lock up. ABS was designed to help you maintain directional control during emergency stops and when road conditions are poor. By maintaining control, you have better chances of avoiding a crash. ABS is especially useful on wet and slippery roads. You should never pump the brake pedal on a car with ABS since the system itself “pumps” the brakes automatically. All you need to do is apply firm and continuous pressure to the brake pedal to activate ABS operation. When the ABS system operates, you may feel a pulsating sensation from the brake pedal. When ABS operation is no longer needed, the braking system reverts to conventional hydraulic operation without intervention from the ABS system. When turning the ignition switch to the on position, the amber BRAKE, ANTILOCK or ABS light on the instrument panel should glow momentarily, and then turn off. If the light stays on, flashes, or comes on while driving, it indicates a fault in the ABS system. Have your car’s ABS system inspected immediately by D & R Intensive Car Care to determine the source of the problem. Your owner’s manual may specify periodic flushing and filling of the brake hydraulic system, which should not be overlooked. This is a service best left to professional technicians, as many cars with ABS have specialized brake-bleeding procedures. Braking systems with ABS can also generate extremely high hydraulic pressures, which can be dangerous. Once again, consult D & R Intensive Car Care if your car needs ABS or hydraulic system service. The brake hydraulic system consists of the master cylinder, disc brake calipers (disc brakes), wheel cylinders (drum brakes), hydraulic lines and hoses, and combination/proportioning valve. When you push on the brake pedal, the force of your leg generates hydraulic pressure in the master cylinder, which then flows through the hydraulic lines and hoses to the wheel cylinders and calipers. The hydraulic force applies pressure through the wheel cylinders and calipers, forcing the shoes against the drums (drum brakes) and the pads against the rotors (disc brakes). In the early 1960s, cars began using split-hydraulic systems and tandem master cylinders. Essentially, this divided the hydraulic system into two separate systems (front and back) ensuring proper hydraulic and braking on one side of the system in case a leak developed on the other side. In the 1980s, some carmakers began to use diagonally-split systems, which took safety a step further. Instead of splitting the system into front and rear, the system was now hydraulically divided into left-rear/right-front and right-rear/left-front. By maintaining one front and one rear brake, the result is more balanced braking when the system develops a leak. By law, all of today’s cars are required to use some type of hydraulically-split system. Brake fluid is a specially formulated liquid used in the brake hydraulic system. Brake fluid must meet one of three U.S. Department of Transportation (DOT) specifications. DOT3 and DOT4 are glycol-based fluids which absorb water. DOT5 is a silicone-based fluid and does not absorb water. The main difference is that DOT3 and DOT4 absorb water, while DOT5 doesn’t. Most cars use DOT3 fluid from the factory. Since liquids can’t be compressed, brake fluid transmits force to various parts of the braking system when you step on the brake pedal. Brake fluid must have a high boiling point because of the heat generated during braking and must not freeze during cold temperatures. Check the brake fluid level in the master cylinder reservoir regularly. D & R Car Care checks your brake fluid at every oil change. Most cars use semi-transparent reservoirs that have level markings to make fluid monitoring easy. If you need to add fluid, use only the type of fluid recommended in your car’s owner’s manual. Do not leave the cover off the master cylinder any longer than necessary as DOT3 and DOT4 brake fluids attract water. Use extreme care when handling DOT3 and DOT4 fluid as it quickly destroys paint if spilled. On cars with disc brakes, it’s normal for the fluid level to gradually drop as the brakes wear. This fluid fills up the space left by the disc brake caliper pistons as they move outward with brake wear. However, if you find that brake fluid needs to be added frequently, there may be a leak in the hydraulic system. Have the system inspected as soon as possible by D & R Car Care. Your owner’s manual may specify periodic flushing and filling of the brake hydraulic system, which should not be overlooked. Periodic flushing of your vehicle’s brake fluid system will remove water and contaminants from the system that may cause corrosion and premature system failure. This is a service best left to D & R Car Care, as many cars with ABS have specialized brake-bleeding procedures. Braking systems with ABS can also generate extremely high hydraulic pressures, which can be dangerous. Once again, consult D & R Car Care if your car needs ABS or hydraulic system service. 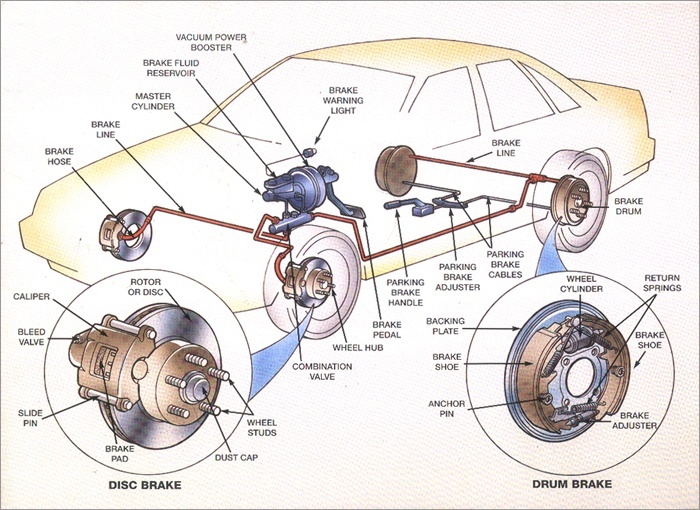 Brake hardware generally refers to the supporting hardware for disc and drum brakes. Hardware related to disc brakes usually includes anti-rattle springs, pad-retaining springs, silencing shims, caliper pins, support keys, return springs, and retaining screws. Typical drum brake hardware includes return springs, hold-down springs, tension springs, and star wheel adjuster. It’s important to note that the exact hardware configuration and names of the hardware vary considerably with different makes and models of cars. Brake hardware is used to retain brake parts in certain locations and can also be used to return parts to certain positions when hydraulic pressure is released. Certain types of brake hardware are also used to silence disc brakes. Symptoms of brake hardware problems may include dragging brakes, squealing while braking, grinding brakes, a low brake pedal or pulling when braking. If your car exhibits any of these symptoms, have it checked out by D & R Car Care as soon as possible. We will replace your brake hardware whenever we service your brakes. Having the hardware replaced during brake service is the best investment you can make to ensure safe braking and the longest life from your new brakes. Brake pads and brake shoes are the friction linings that are pressed by the brake caliper to the brake rotor (disk brakes) or by the wheel cylinder to the brake drum (drum brakes) to provide the friction required to stop your vehicle. Today’s friction linings may contain semi-metallic compounds, non-asbestos organic compounds, ceramics, or others. Brake drums and rotors are the spinning members of the braking system that come in contact with the lining material from the brake shoes and brake pads. Brake drums are usually made of cast iron and brake rotors may be made of cast iron or a composite of cast iron and a stamped steel center section. Brake pads and brake shoes are the wearable friction elements of the braking system. When installed properly, they should provide reliable and quiet braking for many miles. Brake drums and brake rotors provide the mating surface for brake shoes and brake pads. Because of the heat generated from all the friction, a brake drum or brake rotor must be able to remain stable even when subjected to the high temperatures of repeated braking. Have your vehicle’s brakes inspected annually by D & R Car Care to make sure everything’s in order. It’s always best to be able to plan ahead for brake work by knowing the brake condition as your car ages. Brakes are a normal wear item for any car, so sooner or later they’re going to need replacement. Planning can also save you money because the brakes won’t get to the “metal-to-metal” point, which usually means expensive brake rotor or brake drum replacement. Symptoms of brake problems may include dragging brakes, squealing brakes, a pulsating brake pedal (with ABS not functioning), grinding brakes, a low brake pedal, or pulling or shaking when braking. If your car exhibits any of these symptoms, have it checked out by D & R Car Care as soon as possible. The brake booster uses the differential of engine vacuum (negative pressure) and atmospheric pressure (positive pressure) to multiply force from the driver’s leg. This applies increased force to the pushrod of the master cylinder generating more pressure from the master cylinder than from use of the driver’s leg alone. Brake boosters are generally very reliable and require no maintenance. Some boosters have a small filter in the vacuum line supplying the booster. This filter should be replaced periodically to ensure a consistent flow of vacuum to the booster. It should be inspected regularly to make sure that its vacuum connection and hose are sound and that the connection grommet seals tightly around the vacuum connection. Symptoms of brake booster problems include excessive brake pedal effort, a rough running engine, excessive idle speed, or a whooshing or hissing noise. Have the symptom checked by D & R Car Care to pinpoint the cause. Located on the instrument panel, this warning light is usually red and labeled BRAKE. The light glows with the ignition switch in the on position. The parking brake warning light notifies the driver that the parking brake is engaged. This reduces the chances of driving off with the parking brake engaged, causing premature wear of the rear brakes. If your vehicle’s BRAKE warning light comes on, check your owner’s manual to find out its meaning. Unlike some warning lights, the BRAKE warning light does not have standard meanings; it may also be used for multiple purposes. For example, the same light may be used to show that the parking brake is engaged and when the fluid in the master cylinder is low. When in doubt, have the condition checked by D & R Car Care right away. A loss of hydraulic pressure can affect brake operation, which can make your vehicle unsafe. Use your parking brake regularly. Not using the parking brake for a long period of time and then activating it may cause cables and other parts to seize because of corrosion. If the BRAKE light stays on after you’ve released the parking brake, it may indicate a hydraulic system problem because the same light may be used for multiple purposes. There’s also the possibility that the parking brake cable or switch may be sticking or is out of adjustment. Consult D & R Car Care to isolate the cause.